What is the “Carte du Ciel” project? The project “Carte du Ciel” (lit. Map of the Sky) is one of the very first large international astronomical projects. Launched in Paris in 1887, it would include 18 observatories from all over the globe. Its goal was extremely ambitious: to carry out a photographic map of the entire celestial sphere at the beginning of the XXth century in order to pass on precise and objective sky maps to the astronomers of the next generations. It would enable them to compare the maps with the sky of their epoch and to observe changes in the positions or in the luminosities of the stars recorded. Each frame would encompass 4 square (sq.) degrees. Since the celestial sphere measures approximately 41.200 sq. degrees and some overlap is needed in order to avoid errors, a total of 20.600 frames would be needed. Moreover, each frame would be exposed 3 times and each exposure would last 30 minutes, which leads to a total of 30.900 hours of work for the data acquisition only. Each observatory would be assigned its own region of the sky to map, while the observing protocol would be identical in all observatories to ensure consistent results. For that purpose, each participant would build a specific telescope following the model of the Parisian astrophotograph. All frames would be taken on glass plates of 16 cm x 16 cm, enlarged twice, then copied by rotogravure unto copper plates before being printed on paper. This Herculean task took more than 80 years before being interrupted even though unfinished in 1970 because of new developments and technical innovation. 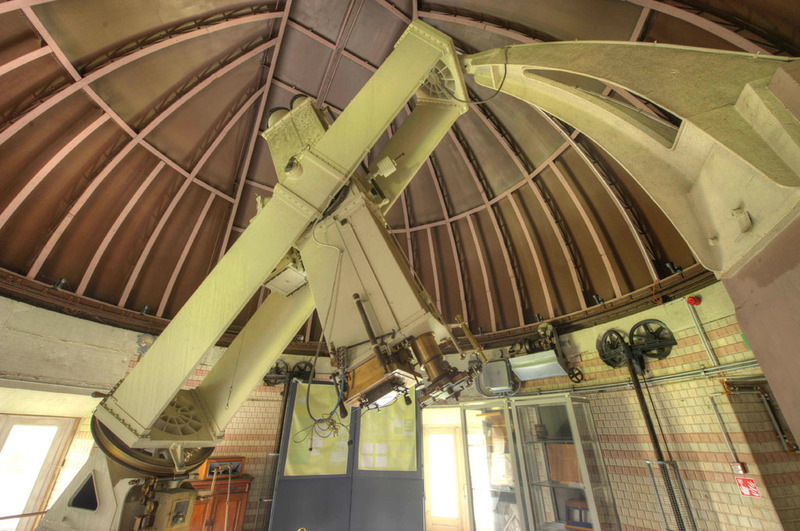 original astrograph in its actual state, located in the annex building nick-named “Carte du Ciel”, built in 1907, when the observatory of Ukkel officially replaced that of Postdam for the realisation of the Carte du Ciel. It all starts with the successful application of photography to astronomy: the brothers Henry from the Observatory of Paris are among the first people to shoot high-quality photographs of (even faint) stars. The director of the Observatory, Admiral Mouchez, shows a great interest for this new method and decides to build an astrophotograph in 1885. Meanwhile, halfway around the world, Dr. David Gill, the director of the Cape of Good Hope Observatory (British Empire), is also getting involved in astrophotography. He suggests to Mouchez to organize an international congress. François Folie, director of the Royal Observatory of Belgium, will attend the first meeting in 1887 but Belgium won’t take part in the initial project. It is only in 1904 that his successor, Georges Lecointe, will officially propose the participation of Brussels. After some delays, the astrophotograph of the “Service de la Carte du Ciel” will become operational in 1908 and despite two world wars, funding issues, and the weather, the Royal Observatory of Belgium will acquire 1232 frames until 1964. Today, the original glass plates, rotogravures and prints are preciously kept in the archive under good conditions and a project of accurate digitization is currently under way. The project of the Carte du Ciel was never entirely finished for various reasons: political and financial ones, but mostly because its duration had been largely underestimated. Belgium had planned a maximum of 20 years of work however its contribution will last nearly 60 years! This was not the case of all observatories: many will abandon their task in the course of the project. Nevertheless, the legacy of the Carte du Ciel is impressive: this first international organization will namely lead to the creation of the International Astronomical Union (IAU) in 1919 while IAU Commission 23 will be in charge of the completion of the Carte du Ciel until 1970. The data collected in the framework of the Carte du Ciel were used in several modern scientific projects including the Tycho-2 catalogue of the Hipparcos mission: ancient stellar positions enabled the astronomers to refine the computations of the stellar proper motions measured by the satellite. But most of the data from the Carte du Ciel plates aren’t available yet in machine-readable formats and their usage is still rare. That’s why the researchers of the Royal Observatory of Belgium set up a digitization project: thanks to a unique custom-built machine, the Carte du Ciel’s photographs will soon be scanned in a resolution never reached before. This will enable the scientists to exploit this huge amount of data and maybe lead to some new discoveries. 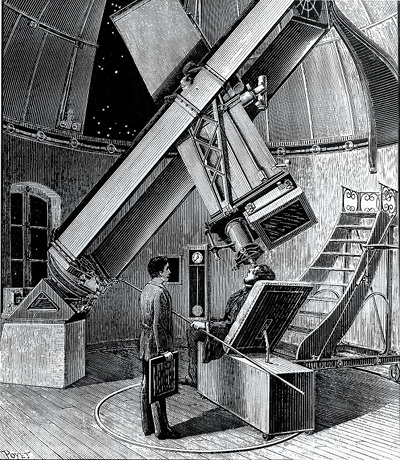 left image : Engraving of the Parisian astrophotograph illustrating astronomers at work. The telescope consists in a photographic objective of 33cm of diameter and a focal distance of 3m43 fixed to a second visual objective of 25cm of diameter and 3m60 of focal distance used to track the stars during the 30 minutes of exposure. right image : Original picture from the Carte du Ciel taken at Uccle: Each star is represented by 3 points placed on the edges of a small equilateral triangle of 18/100 mm side length (1 point per exposure, the plate being slightly moved between each exposure).